Home / Blog / The holidays are coming up! Posted Nov 6 2010 by Stella Garcia	in News	with Comments Off on The holidays are coming up! As I watched the snow flakes fall outside my kitchen window in Ottawa over Halloween weekend, I realized that I am not prepared yet! When you grow up in Mexico it is not uncommon that you directly relate wearing winter coats and snow with Christmas. So as soon as I see snow flakes, my mind automatically thinks about Christmas! As I saw what my husband kept describing as “fluffy rain”, I realized that I am not prepared for Christmas yet! The plane tickets to visit the family for the holidays have been bought, but I seem to be behind in one area; I have not given any thought to holiday cards! Regardless of your spiritual and religious views, December (for most people in this country) is a time for sharing gifts and good food with close family and friends. It is also a perfect time to share good news and send loved ones greetings. 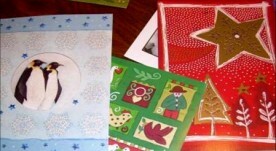 It wasn’t too long ago that most of the holiday greeting cards were dropped off by the mailman. Sometimes they included a picture, always some stories and lots of love. Nowadays with electronic communication people are not necessarily sending physical cards through the mail, it seems that most are sending their love through the internet. So I think we will go with the trend and send our best wishes through facebook, twitter, and e-mails, but somehow that doesn’t seem special enough to me. I want to do something more, maybe upload a video on Youtube or create a cartoon with your own personalized message on www.xtranormal.com. I guess it all depends on what I can convince husband to do! So even though I am still not sure HOW we’ll be reminding our loved ones that we are thinking about them at Christmas time, I am sure that somehow we will. Now if we can only get the right picture ……. more on that later!